I stumbled upon these wonderful Art Deco flats behind London's Kings Cross station. Cecil Rhodes House has a great vertical expanse of glass bricks, no doubt lighting the communal spaces of the block. Each flat has a small balcony with a rounded end, set symetrically fron the central tower and above the entrance there are two sculpural lights. 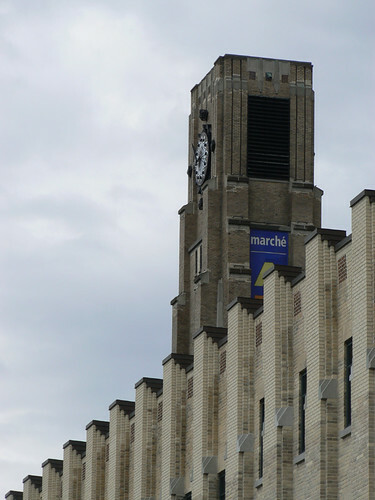 Atwater Market in the St Henri area of Montreal, opened in 1933. 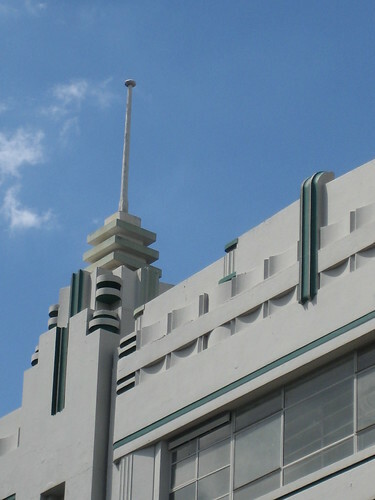 It is located in this long Art Deco building with a tower featuring an ornate clock. In December 2002, the market suffered about $1 million damage in a fire but has since been restored and remains a foodie (and Art Deco) mecca. 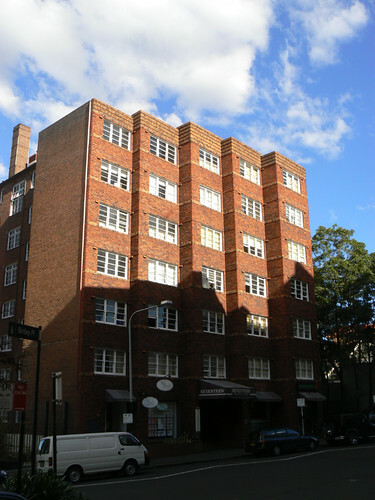 Belgenny Apartments in Surry Hills, Sydney dating from 1937. 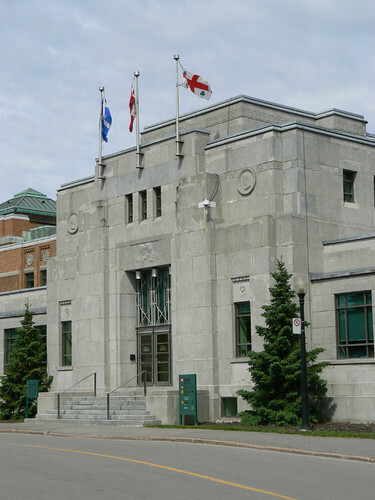 According to the Côte-des-Neiges booklet from the 10th World Congress on Art Deco in Montreal, it is difficult today, to find much information about the museum which occupied this building in a past life. 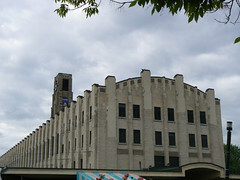 The building was built in 1935 and the architect was Paul M Lemieux. The current occupant is a pharmacy chain and the doors enclosed in this large arch are no longer used but the words "Musée Historique Canadienne" can still be seen inscribed into the façade. 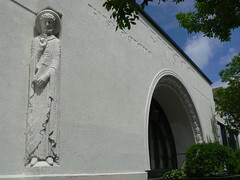 An unsual aspect of the building is a series of religious figures that stand in niches at the corners of the building. They don't appear to fit with the use of the building as a museum. This is an interesting house in the Victorian town of Kyneton. 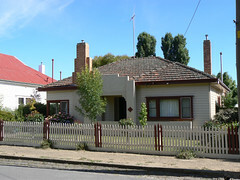 The house is a fairly standard Australian weatherboard house except for the Art Deco style stepped brick chimney and (perhaps rendered) front porch. I like how the owners have brought their colour scheme onto the picket fence around the front garden with the regular placemnet of three taller pickets painted brown. 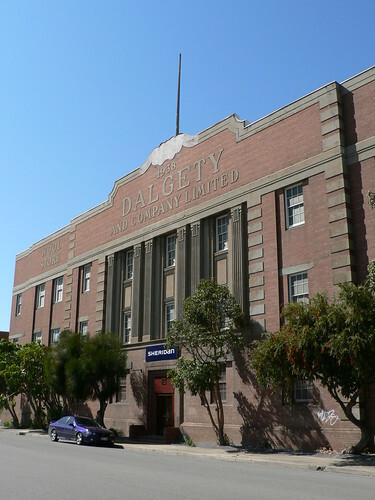 This wool store in Port Adelaide was built for the Dalgety Company in 1938. Hastings on New Zealand's North Island suffered greatly during the 1931 earthquake which also greatly affected the nearby town of Napier. 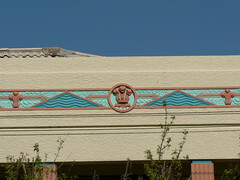 Much of Hastings was rebuilt in Spanish Mission or Art Deco style. 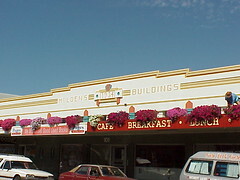 Holden's Buildings from 1934 is a fine Art Deco example. It was deigned by Albert Garnett and carries the year of construction in a beautiful Art Deco styled plaque. 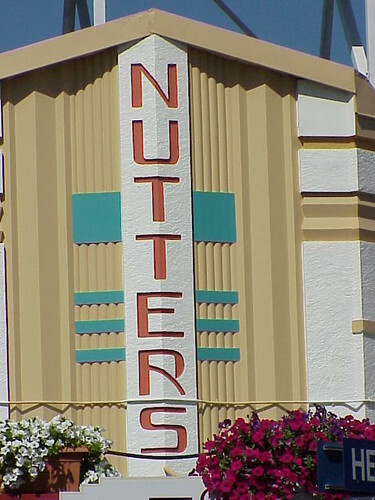 The corner fo the buildings bears the name 'Nutter' and is therefore known as Nutter's Corner. 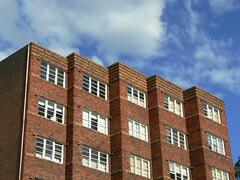 These Art Deco apartments are at 17 Elizabeth Bay Road in the Sydney suburb of Elizabeth Bay. I find the stepped facade very interesting and extremely pleasing to the eye, especially when the roofline is seen against a cloudy blue sky. The minimal decoration on the building comes from the use of different coloured bricks. Along the top of the facade a wide horizontal band is defined by five double rows of lighter bricks laid with the narrow end protuding slightly from the surface of the wall. This technique is repeated in a single row of bricks directly below the level of each window. However, between the windows, a second row of identically orientated bricks has been added continuing around the angles created by the stepping of the overall facade. The attention to detail of the designer is emphasised by the symetrical placement of vents aligned with the top level of each window. One vent has been placed parallel to each window while the other has been placed perpendicular to the window on that part of each stepped element. 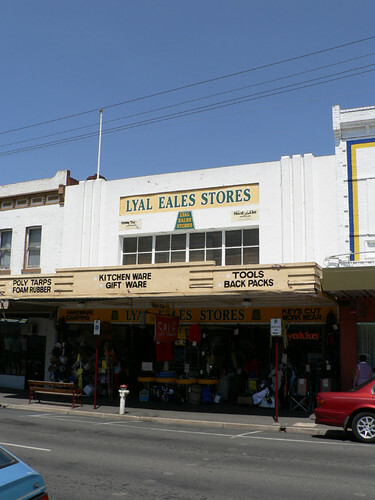 The Lyal Eales Store in Maryborough, Victoria is an exmple of Australian rural deco. Simple decoration providing a pleasant shopping experience for all visitors to town. 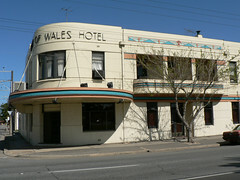 This is the Prince of Wales Hotel on Port Road, Queenstown in Adelaide. It is a classic two storey streamline Australian pub. The building curves around the corner with the main entrance protected by a large rounded canopy. 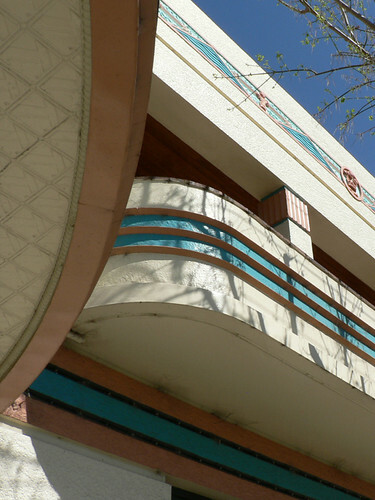 The underside of the canopy is covered in pressed tin bearing a repeating Art Deco pattern. Along the Port Road side of the building there is an open balcony with curved ends and a series of three ridged lines providing simple decoration. Along the facade near the roofline there is decorative frieze consisting of triangles enclosing several rows of wavy lines, horizontal lines with arrowheads and several fleur-de-lis, the symbol of the Prince of Wales. In these photos, taken in 2005, the decoration is picked out in two shades of bright blue with other elements in a terracotta colour. Since then, it appears that the hotel has been taken over by the Port Adelaide Magpies Football Club and the building has been painted all over in a dull grey. There is a photo on their website. At least it is only paint. "...a burial facing the open sky ... The whole could not fail of noble effect...". 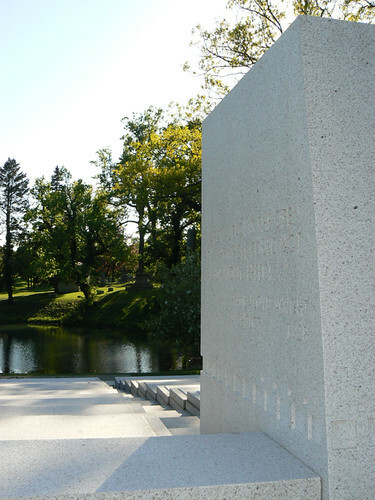 These words, by Frank Lloyd Wright, are inscribed on the headstone of the Blue-Sky Mausoleum at the Forest Lawn Cemetery in Buffalo. 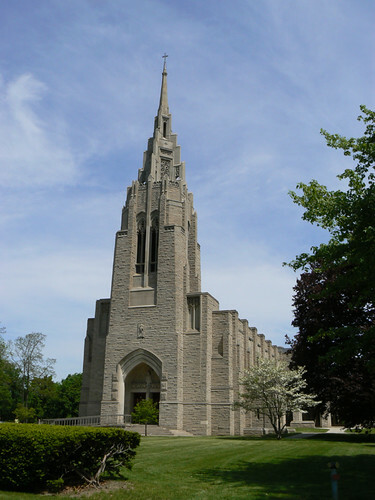 Wright designed the mausoleum in 1928 at the request of Darwin D Martin, secretary of the Larkin Soap Company. 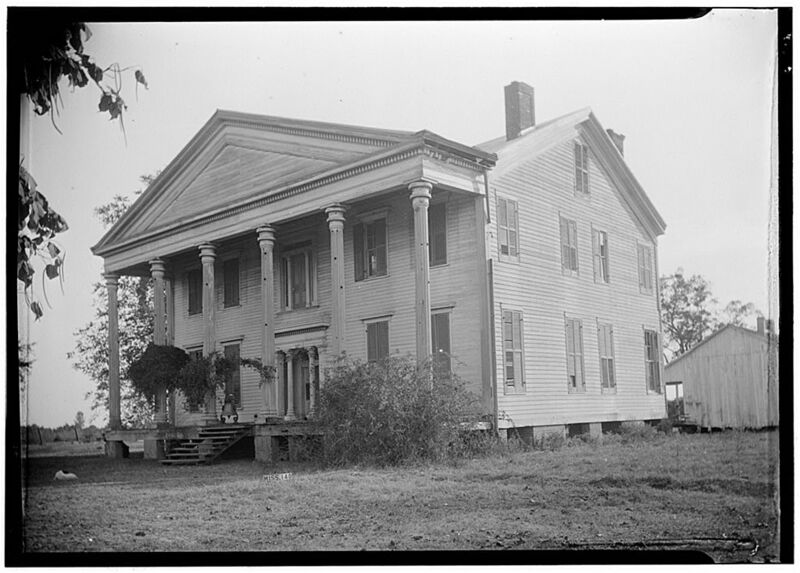 He had previously designed his residential complex in suburban Buffalo, a summer residence, Greycliff, in nearby Derby and the Larkin Company Headquarters (demolished). 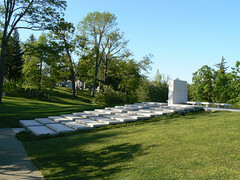 At the time, the mausoleum was not constructed however in 2004, the Forest Lawn cemetery faithfully realised the project. The mausoleum consists of 24 crypts, aligned in pairs stepping up a grassy slope overlooking a small lake and if you feel the need to be buried in an architectural masterpiece, the crypts are available for purchase. 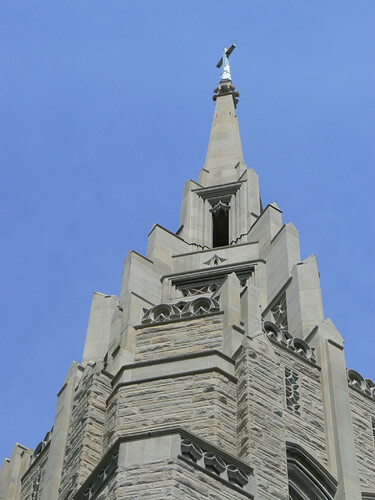 The church was constructed with an Indiana limestone façade according to plans developed by the Reverend Dr. Weldon Crossland and the architectural firm of Wenner and Fink, Methodist Church Architects, located in Philadelphia. I like the stepped style of the body of the church, mirrored in the buttresses of the spire. 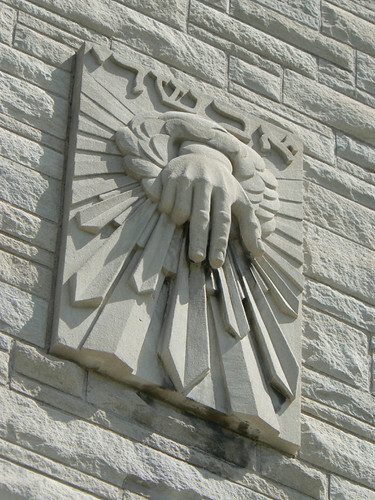 And this spectacular art deco style 'hand of God' plaque on the face of the spire directly above the main entrance. The inner suburbs of Melbourne are dotted with former dairies and stables dating from a time when family run companies produced dairy products for their immediate neighbourhood. 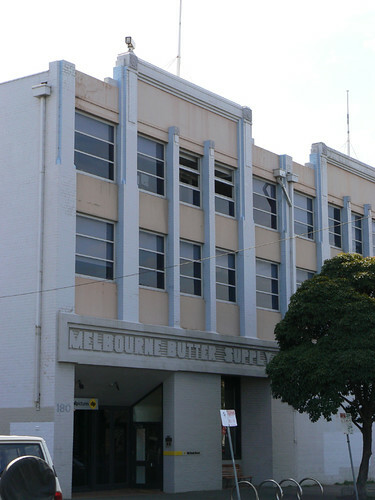 This building is the former Melbourne Butter Supply building in South Melbourne which given the size of the building must have served a much wider area than the few nearby streets as the smaller dairies would have done. 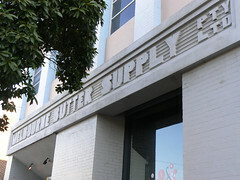 The building is not overly decorated but the stylised lettering on the company name is marvelous. This is the Prefcor Building in downtown Durban. 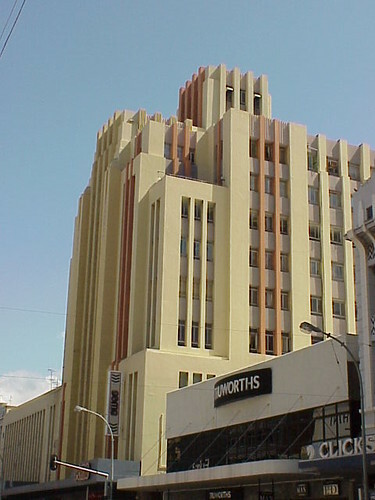 The bulding was originally Payne Bros Department Store. The Facts About Durban website says that when the store opened in 1938 it had the longest escalator in the Southern Hemisphere and local children used to visit the store just to ride on it. 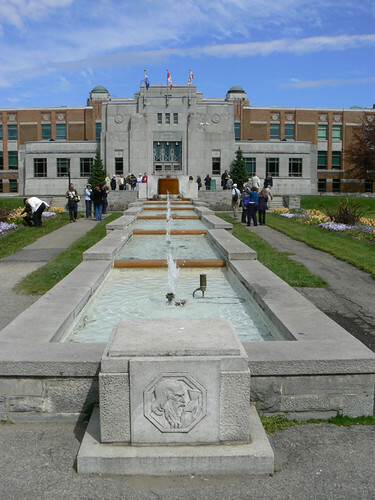 The Administration Building at the Botanical Gardens in Montreal were built in 1937. 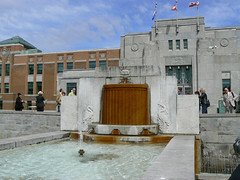 The building was designed by Lucien F Kéroack with reliefs by local Montreal sculptors Henri Hérbert and Joseph Guardo. There are a series of octagonal-shaped plaques near the roofline along the front of the building but the most eyecatching panels are located on the towers at either end. 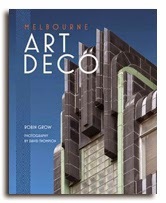 The Rosemont tour booklet from the 10th World Congress on Art Deco idenifies Hérbert as the creator of the colour reliefs. There are four designs each depicting a different Canadian plant. 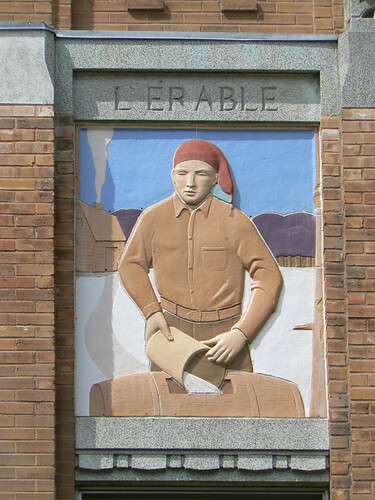 One panel, L'Érable shows a man pouring sap from a Maple into a barrel. 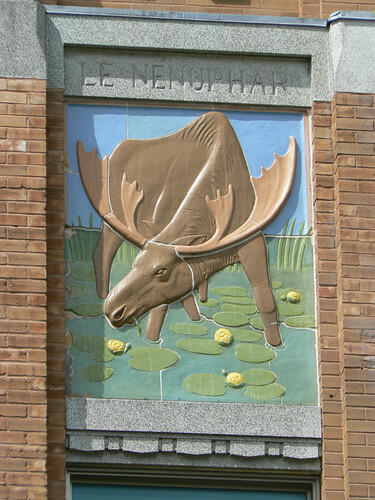 Another, Le Nénuphar, shows a moose eating Water Lillies. 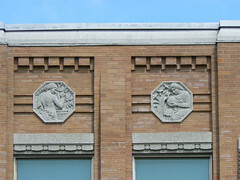 The other two designs feature Native Americans. 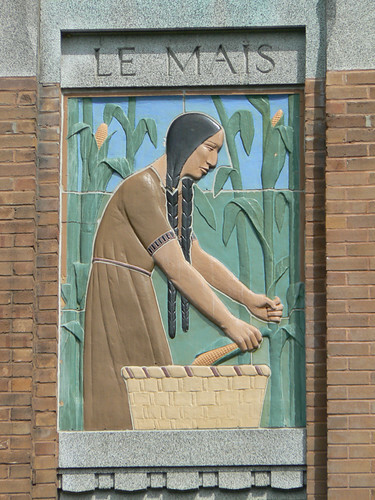 Le Mais shows a woman picking corn. 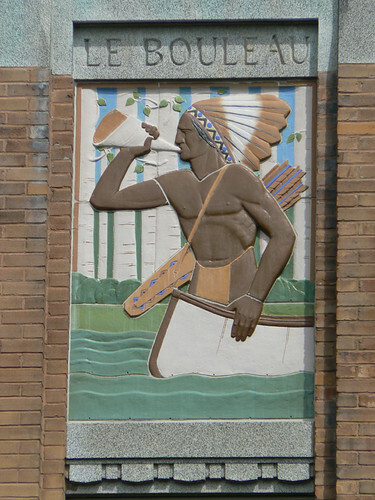 And finally, Le Bouleau, has an Native American man in a birch canoe. The Botanical Gardens in Montreal were establised in 1931 but it wasn't until 1937 that the main Administration Building was constructed. 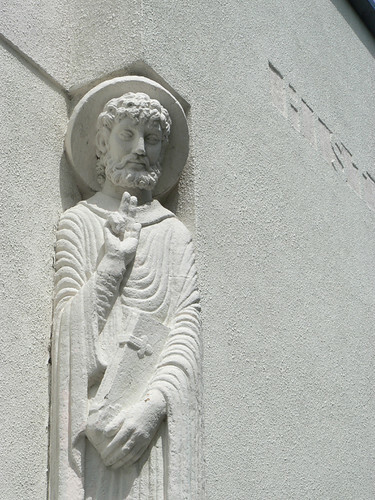 The building was designed by Lucien F Kéroack with reliefs by Joseph Guardo and Henri Hérbert. 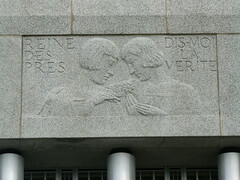 This relief by Hérbert above the door to the Administration Building shows two girls enacting the rhyme "Queen of the Meadows, Tell me the truth", pulling the petals from a daisy. 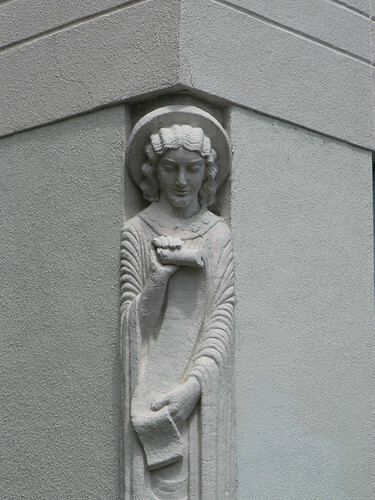 Other reliefs on the exterior of the building will be the subject of tomorrows post. 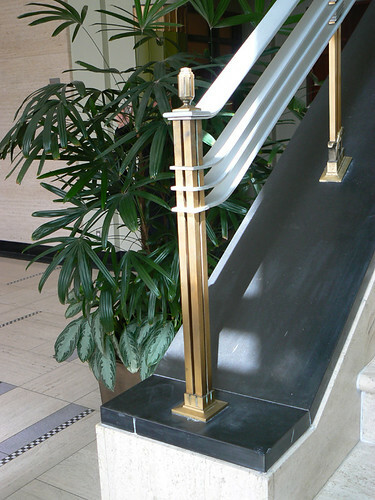 The foyer is relatively plain with Art Deco style lighting, curved heating units under the windows at the base of the two sets of stairs that climb from each side of the reception area and feature these metal handrails. 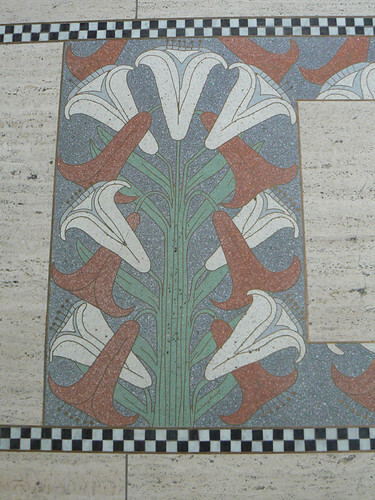 The flooring includes this wonderful pattern of stylised lillies. The Botanical Gardens in Montreal were established throughout the 1930s. 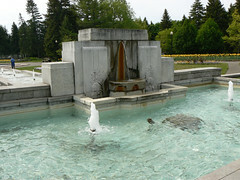 This typically Art Deco fountain is in front of the Administration Building. 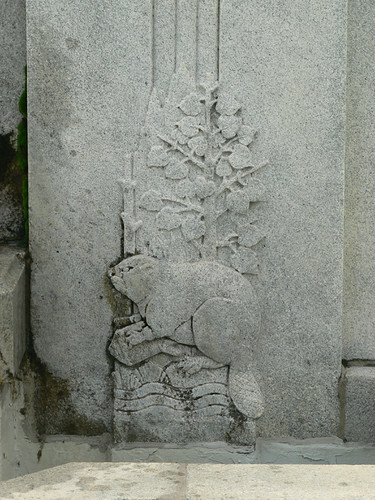 The stepped design is obvious to even a casual glance but there are also reliefs featuring native fauna. The beaver is a local favourite. The fountain stretches through the gardens in a series of shallow pools. From this angle the lines of the fountain echo the stepped roofline of the central section of the Botanical Gardens Administration Building. This side of the fountain allows the water from the higher level to pass through a number of holes to the pools mentioned previously. 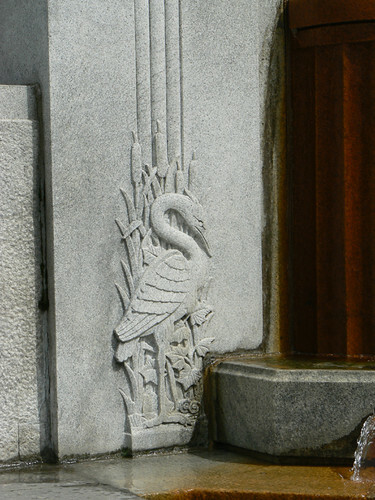 It features two reliefs of cranes or similar long-legged water birds wading among the bullrushes. Each bird is different from the other providing a naturalistic yet still symetrical arrangement. 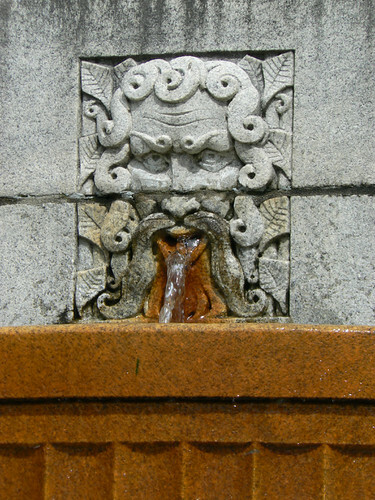 The main passage for the transfer of water to this side of the fountain is through the mouth of a mythical figure. 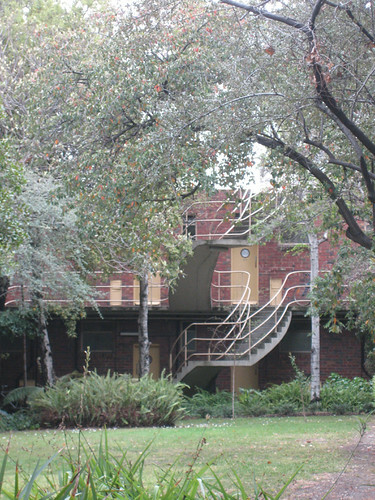 In a recent email, Brian from the Fitzroyalty website expressed surprise that I hadn't written about a block of flats called Cairo in Nicholson St, Fitzroy and did I know of them. I didn't have to think for long because I do know of them but the gardens are so overgrown that it is difficult to get a clear photo. He got me thinking though and I had a look at his post on Cairo from January 2009. From my point of view the best part of Brian's article is the use of photos from the archives which show the flats soon after they were built and before the garden matured. Then I read Philip Goad's article, Best Overend - Pioneer Modernist in Melbourne from Fabrications : The Journal of the Society of Architectural Historians, Australia and New Zealand, Vol 6 published in 1995/6. It is a great read. In 1931, in his early 20s, Best Overend went to London and worked for 18 months as Chief Draughtsman for Wells Coates. 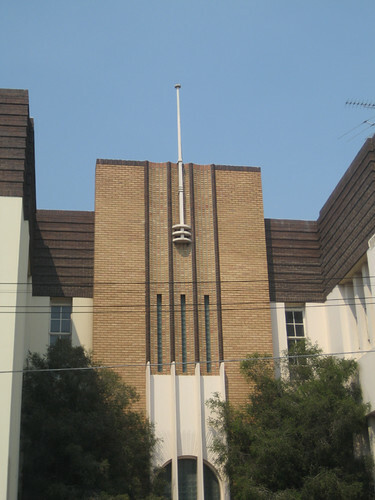 Returning to Melbourne in 1933, Overend, having passed his Royal Institute of British Architech exams while in London, joined the architectural firm of H Vivian Taylor and G A Soilleux. 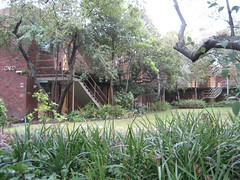 Overend designed Cairo in 1935 as a U-shaped block of minimum flats with a communal dining room. The block also had two communal laundries on the roof and garages at the rear of the property. 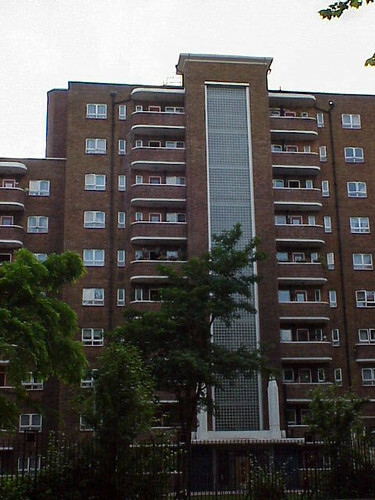 Certainly there is an interesting connection to the Lawn Road Flats which Wells Coates designed in 1932 when Overend was working for him in London. 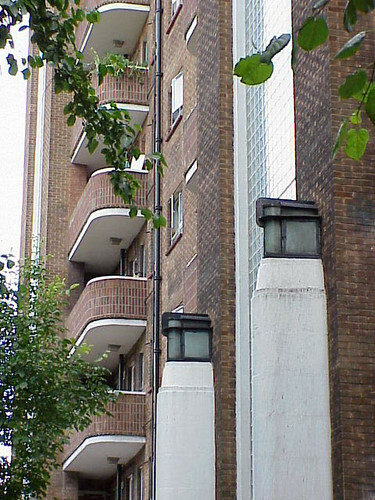 The outstanding feature of the Cairo flats is the cantilevered stairs at the centre of the block at the bottom of the 'U'. My photo does not do them justice but there is an excellent archival photo in Brian's aforementioned artice which really shows how astounding these stairs are. 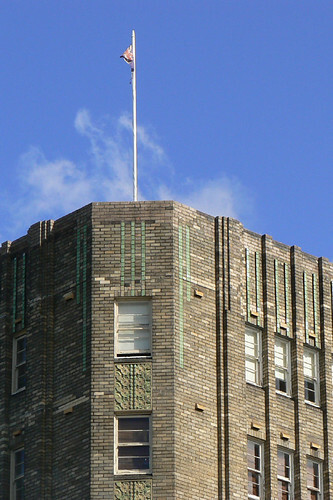 The former Collingwood Technical College is a bit of a hidden gem in Melbourne's Art Deco landscape and international street art in general. 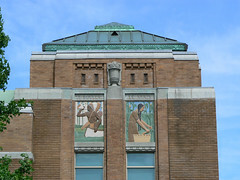 The building was designed by Public Works Department architect Percy Everitt in 1943 and this picture (above) shows the former main entrance. It has a cyclone fence across it now so it does look a bit neglected but at least it has been preserved. A new entrance has been created around the corner where the former college is much more streamline with long horizontal bands of windows and cream coloured brick. 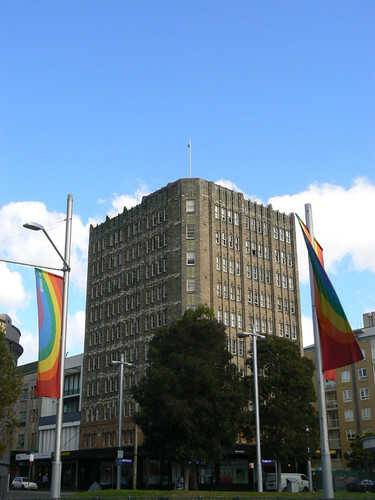 After facing the threat of demolition a few years ago, the former Tech is now used as a Neighbourhood Justice Centre by the State Government. 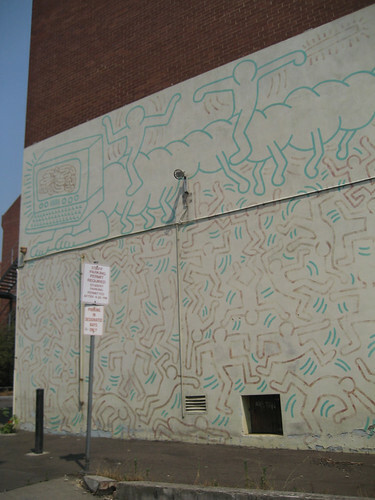 The twist in the history of the former college comes in 1984 when New York street artist Keith Haring visited Melbourne and painted the wall facing the car park. It features Haring's trademark simple figures with a large centipede with a computer for a head along the top.